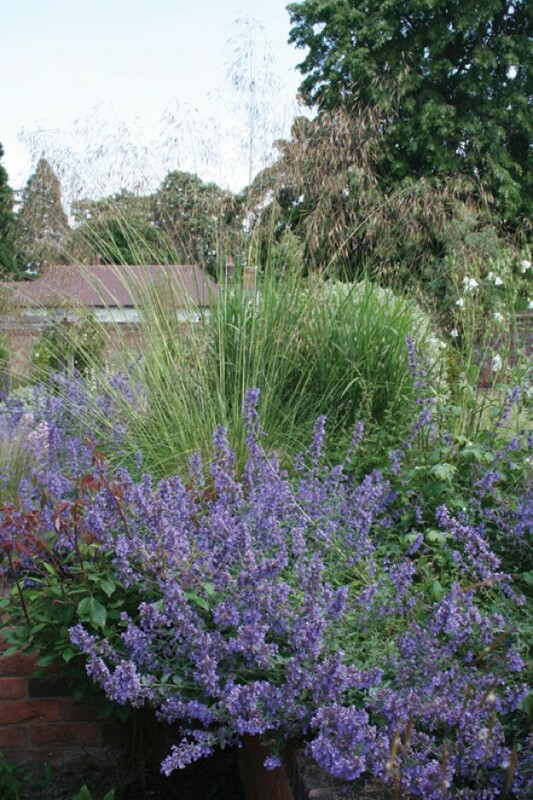 Hannah Genders revisits one of her previous projects and offers advice on maintaining an attractive garden. It’s really great to go back to a garden that I originally designed and see it looking more established. This is particularly relevant to the planting – as I’m putting it in, I imagine how it will look in a few years’ time. I recently had the opportunity to revisit a garden that I had designed five years ago for a lovely house in Lapworth. The house is an old tannery barn (from the days when people tanned leather) and the owners at the time were converting it into a very stylish new home. The conversion created lots of high ceilings, light space and glass; the materials they used were reclaimed but the effect was quite modern. I wanted to reflect all this in the design of the garden which at this stage could have best been described as a “blank canvas” – or at worst, a muddy field! The design came together as a series of courtyards around the house, with a walk-through scented pergola and a large patio area for eating out. This created some very sunny, sheltered areas at the back of the property and more structural shrub planting at the front. A central pathway leading away from the house and up some steps linked in the rest of the garden. The original design had this central area surrounded by pleached hornbeams and although I didn’t complete this at the time it is one of the things we have managed to achieve recently in updating the planting on site. The planting design around the courtyard areas was a classic style, with lavenders and roses in the very sunny beds near the house. Over the scented pergola I planted jasmines, climbing roses and wisteria. At the side of the property we created a formal potager, with gravel paths, clipped box hedging and room to grow fruit on the old walls and some vegetable plants. As I said, we built this garden about five years ago and only last year the owners sold the property to a new couple moving into the area. They loved the house and the garden and contacted me to come and look at the garden, assess what was doing well and help improve what was already there. The planting had done really well on the whole; the lavenders and roses looked lovely as they had now matured and the lavender had been kept trimmed into a neat shape. There are two borders at the top of a low wall separating the more formal courtyard area from the rest of the garden, and I had planted these with a mixture of ornamental grasses and striking perennials. These areas looked great now that they had matured, and were doing what I had intended in softening the view out from the house and giving a lovely texture and movement to the paved courtyard spaces. We updated and followed the original design and put in those hornbeams – they were pleached, which means they have a clear stem and allow a view through the space whilst defining an area. To make this central area of the garden feel special we underplanted the hornbeams with drifts of perennials to cover the ground. These included the Heuchera ‘Chocolate Ruffles’ which is grown mainly for its dark purple leaves, epimediums for their lovely delicate flowers and autumn colour, and for scent, Lily of the Valley. We also planted nine pleached hornbeams along a neighbouring wall to give more privacy for the owners. I love including lots of bulbs when I do a planting and these were looking good when I went back to visit, but we did feel it would be good to add more. So last autumn we planted 200 dark purple tulips in the courtyard area and about the same number of white tulips in the potager, which with the clipped box hedging should look amazing next year. The shrubs at the front of the house had matured well in their allotted spaces; we had some pernicious weeds to get rid of and some more under planting to do to fill in some gaps. The mixed dogwoods planted to hide an electricity box were doing their job really well. I do believe this garden, with its new, keen owners, will now go from strength to strength and I can’t wait to go back and visit again in a few years’ time. Due to local demand I have recently taken on several projects like this: re-visiting a garden, or looking at a new project and updating the planting. I also offer a high quality maintenance service for keeping your borders in check. Do contact me if you want any more information.